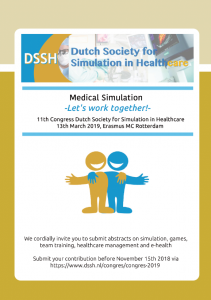 The Dutch Society for Simulation in Healthcare is a non-profit Society. The ultimate goal of our Society is to promote and facilitate the development and implementation of simulation and ‘Serious Gaming’ in healthcare. This, in order to heighten standards of education, training, scientific research and ultemately, patient safety. Would you be interested in contributing to our cause? You can help our Society tremendously by donating!. Because we will probably all be a patient -someday.